Whether its content sharing or storage space, these problems are solved by embedding the content of a separate website or domain on your posts and the easiest way to do it is using IFrames. IFrames are used on almost every website and webpage these days and for a good reason. IFrames lets you create a medium to display content or web pages to and from a completely different website without having to worry about having the content stolen or copyright allegations. The way IFrames basically work is that they let you display a different webpage on some portion of your own webpage by embedding it. The code inside an embedded webpage can’t be directly accessed which creates a certain sense of content protection. Why should we use iFrame? Obviously, there are other methods for embedding content such as using AJAX or HTML5 web elements or other, but in many cases, iFrame’s just a better choice. For one, iFrame embedding is used for Cross-Domain content, usually visual content. What this means is that a website user can freely request the selected resources from a separate website and view it but is restricted from accessing or manipulating the element or code itself. Furthermore, you can easily place advertisements on your website using IFrames and set up multiple iFrames in a single webpage without a lot of difficulties. This is always useful if you want to monetize your website. iFrames are also used a lot for embedding visual and audio content. Whether its video or audio or images it’s a great idea to use iFrames to preview these content as you can easily host them on external servers and sources and easily link it without any difficulty. This makes sharing your content easy as other website owners can also easily use your videos on their posts and furthermore, the viewership and web analytics are shared with you as well. Furthermore, uploading to third party websites such as Youtube, Vimeo, Dailymotion, etc. saves space while retaining accessibility. 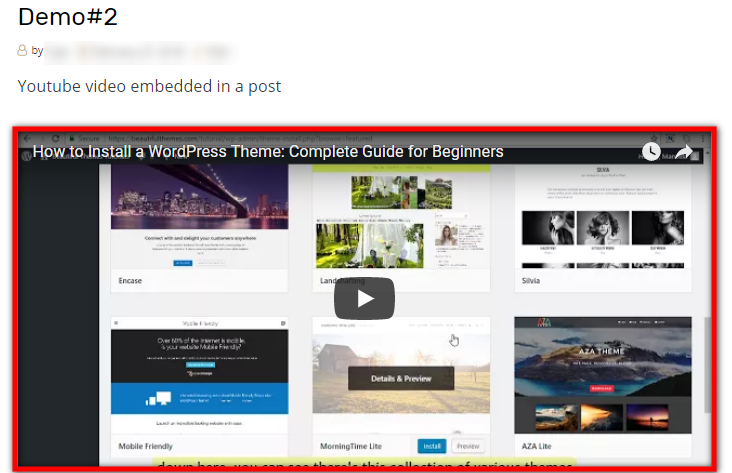 Following this process, you should be able to easily embed any page on your posts. Whether its images, visual content, audio or more. Furthermore, content websites such as Youtube have an in-built embedding feature for you to share the content. Simply click on Share and Embed and copy the given URL. Now plugins can easily setup WordPress iFrames and add more customizations. Now we can’t explain the working method of each and every plugin but the basic idea should be universal, and most of the popular Embedding plugins should work in the similar process. So regarding this, we’ve chosen this Advanced iFrame plugin by Michael Dempfle. This plugin works by letting you inserting its [advanced_iframe] shortcode instead of the IFrame attribute and even providing a UI to build your customized iframe shortcodes. This is better as WordPress removes IFrame tags for security purpose. Furthermore, the plugin adds more customization to your tags and generally makes your work easier as well. First, let’s install this plugin. If you aren’t sure about the process of installing plugins refer to here. There are two ways to use this plugin, one directly by using the given parameters and another by using the plugin’s user interface. The direct way of using Advanced iFrame is identical to using the iFrame HTML tag, but instead we use its shortcode. Once you open any posts, you should be able to see a ‘Add Advanced iframe’ button. Click on the button and it should insert a default iFrame shortcode onto the editor. This default iFrame url and settings can be changed through the settings UI of the plugin but we will deal with that later. For now, we can simply change the source url to any website we need and change the parameters of the shortcode similar to how we add parameters to an iFrame HTML tag. The process of making shortcodes and adding parameters might be difficult for someone new to WordPress or HTML, so the developer has provided an easy to use UI to create our customized shortcodes. First, click on the Advanced iFrame listing on the dashboard and direct yourself to the basic settings. This is the menu where you will be doing most of your work. URL: Insert the URL for the page you want to embed here. The plugin also checks if the URL is valid and allows iFrame embedding. Width/Height: Here you can insert the dimensions for your iFrame window. You can insert the values in either pixel or percentage. Margin width/height: Insert the margin’s height and width in their respective boxes. Frameborder: You can enable, disable or define the border size of your iFrame. Inserting ‘0’ removes the frameborder. Transparency: You can set the value ‘Yes’ or ‘No’ or ‘True’ / ‘False’ Enabling transparency makes the transparent and displays the background on it. Using these settings you can easily enable your iFrame window. The plugin also provides for tons of other features however we will not be going through them as it would make the entire process complex and difficult to explain. Click on ‘Generate a shortcode’ once you are satisfied with the current settings. This generates a customized shortcode for you to copy and paste onto your posts. Similarly, if you want the current settings to stay as your default settings, you can click on Update Settings displayed on the bottom of the window to make it the default setup. This lets you instantly access the current shortcode using the Add Advanced iFrame button we’ve explained in the step above. Similarly, reset settings resets the default the shortcode. Always keep a major check on the number of iFrames you embed on a single webpage as too many iFrames can hamper your website’s loading speed as the require separate resources to load onto the page. Now that you know how to use iFrames you are ready to go ahead and share cross-domain content. There are other ways to embed content as well, but iFrames are easily the best medium for beginners as they are extremely easy to set up. There are also alternatives to the Advanced iFrame plugin and you are ready to experiment them if you want. As we’ve explained before, their working method should be identical. How to add SSL and HTTPS to WordPress site. How to make a WordPress website multilingual. WordPress guide to setting up user roles and permissions. ← How to Add WordPress Rich Snippets- 5 Best Rich Snippets WordPress Plugins for 2019! Hey Author thanks for posting such relevant information. I think many of the people don’t know this strategy and I am sure this will really help all the website developers. I just looking for the perfect I-frames for WordPress, and I love WordPress as a web development so it’s just a good information given here in the post that will help a lot of people, Thank You! Very nice post. Just what I was looking for to implement a major customer’s GDPR compliant contact form in a project website on a different server. please help me. I use an url in the frame but not show. that site does not appear SSL. why don’t add this? We think you need to consult it with the site owner for this matter. 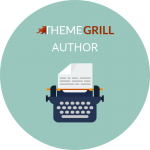 But if you’ve used one of our themes, you can inquire it on https://themegrill.com/support/ .